The author of the notes speaks of alien sightings and his drawings depict unidentified flying vehicles, alien astronauts, sacred geometrical figures, and more. The following picture depicts the Tampa Bay sighting of 1977, which was probably a life-altering event for our protagonist. He drew at least half a dozen flying saucers near the Tampa Bay pier. The inverted pyramid building near the coast is the central focus of this event. From the building's top, a vortex of energy is being shot towards the alien crafts and the sky. Surrounding the base of the vortex, there are two smaller objects that can be decoded as alien drones, next to a couple of winged extraterrestrials - as you will see. Clear and detailed depiction of flying saucers and two winged extraterrestrial beings. Notice the inverted pyramid building from Tampa Bay. The following drawing depicts a four headed extraterrestrial being. The alien is dressed in a space suit and wears helmets on all four heads. The wings look very mechanical. I speculate that this drawing is a combination of the ancient historical accounts about ancient "gods" (as depicted by our ancestors) and our protagonist's personal experience at Tampa Bay. By analyzing more drawings of this same "thing", I have reached the conclusion that it represents ET astronaut/s inside a flying craft. The following drawing has it all! The eagle heads may be a direct reference to the Sumerian accounts of the Anunnaki and their eagle helmets - a.k.a. space helmets of the ancient "gods"; also, the human being with 3 more ET heads, may be a reference to the DNA manipulation of our species, by several ET species. The bottom serpents support my hypothesis. The following is a blend of religious accounts and a clear connection to extraterrestrials. The first clear depictions of Ezekiel's wheel are drawn from three different positions. They hover above some kind of winged alien beings. The entire scene takes place either at the North pole of our planet, or at one of the poles of an unknown planet. Giving the fact that the protagonist was sort of obsessed with drawing maps, it is strange that the pole in this drawing only vaguely resembles the North pole. 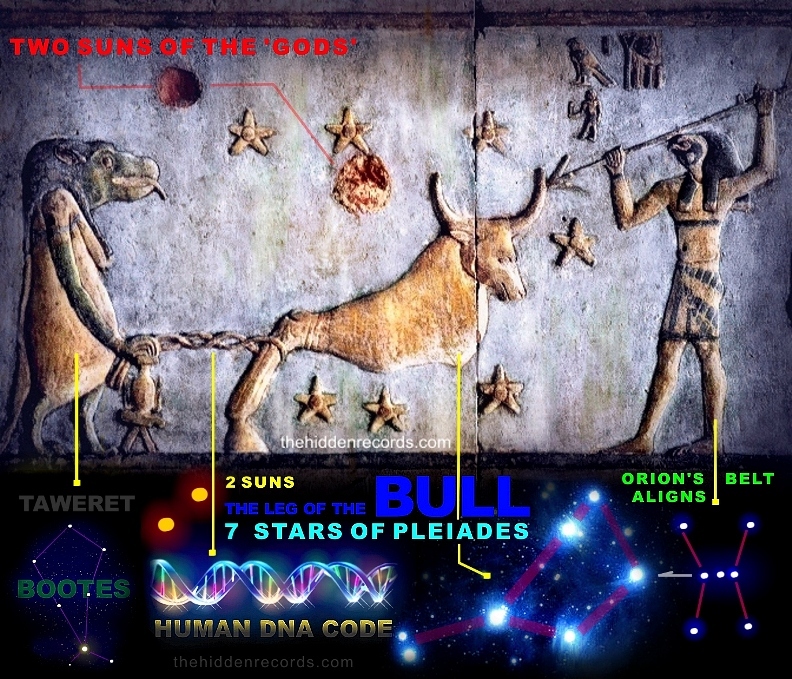 The following is described by Dan as a cow with helmet, but in my opinion it depicts the constellation of the Pleiades, also known as "the leg of the bull". This constellation was pointed out as the home of the "gods" by all major ancient civilizations and judging by the huge number of depictions, they were obsessed with it. The following drawing made it clear for me that the four-headed "thing" with mechanical wings is an ET space craft with on-board astronauts, but drawn to resemble with the depictions of the ancient "gods", made by our ancestors. Interesting to note: the four heads of the flying vehicle are: human (us), bull (Pleiades), cougar (unknown to me) and eagle (Anunnaki). The following drawing shows an in-flight unidentified flying machine, resembling Ezekiel's wheel, while on the ground there are two speeding trains. One of them is shaped to look like a cougar, hence making the connection between machines and animals even clearer. Multiple types of alien crafts are seemingly flying out of a mothership. There are classic flying saucers, Ezekiel's wheel-type and the ones resembling alive beings. I hope you have enjoyed as much as I have looking at the mysterious drawings of Daniel Christiansen. Whatever happened that day at Tampa Bay, apparently changed him forever. Please let me know what you think in a comment down below.